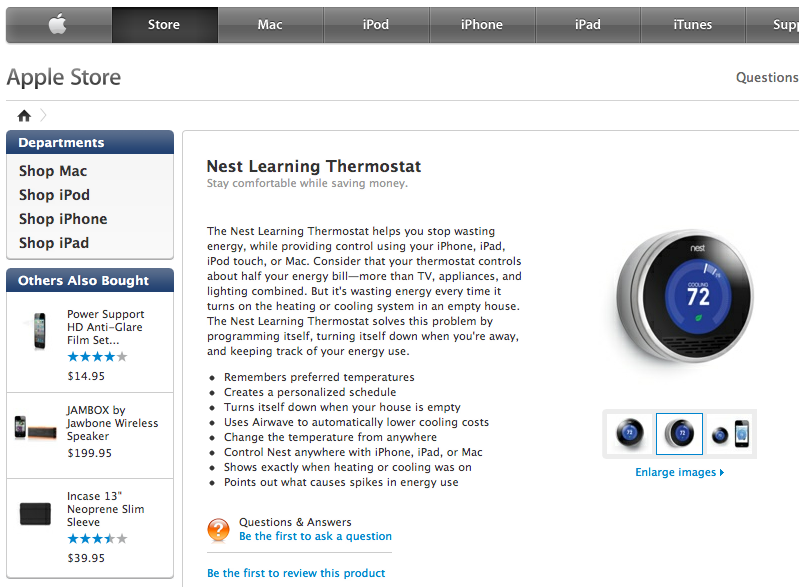 As was reported last week, and subsequently verified by or sources at Apple (here and here), Tony Fadell’s Nest Learning Thermostat has hit the Apple Store. After a several-hour international outage last night, the Apple Store came up briefly this morning and showed the Nest Learning Thermostat for sale at $249.95, which is a $.95 premium over its suggested retail price. Fadell is known as the “Father of the iPod” for his role at Apple, where he brought the idea of a portable music player to Jobs’ attention. He then led the iPod division until his retirement a few years ago. After leaving Apple, Fadell founded Nest, which builds a learning thermostat with an iconic interface that many compare to the original iPod due to its circular dial. While the connection to Apple is there, there is no direct technology connection to Apple products, making it a bit of an oddball inventory choice. Sure, you can control the Nest from your iOS device or Mac, but you can also control it from any smartphone or PC. We are not expecting Apple to carry other thermostats or home heating, ventilation and cooling (HVAC) products in the near future.